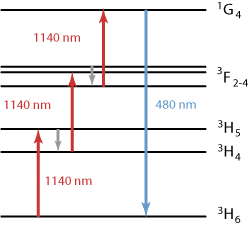 Figure 1: Level scheme of thulium (Tm3+) ions in ZBLAN fiber (a kind of heavy-metal fluoride fiber), showing how excitation with a 1140-nm laser can lead to blue fluorescence and laser emission. The short gray arrows indicate multi-phonon transitions. When a medium (e.g. a laser gain medium) emits fluorescence as a consequence of being excited with incident light, the wavelength of the fluorescence is usually longer than that of the exciting light. This means that the photon energy is reduced. However, under some circumstances upconversion fluorescence can occur, where the wavelength of the emitted light is shorter. This is possible via excitation mechanisms which involve more than one absorbed photon per emitted photon as outlined below. One kind of mechanism, as illustrated in Figure 1, is sequential absorption of pump photons by excited-state absorption. A first absorption process leads to some metastable excited level, from where further absorption can take the ion to even higher levels. Such processes require high pump intensities, but not necessarily high doping concentrations. With suitable level configurations as e.g. 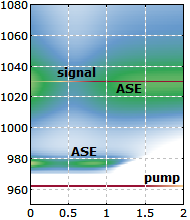 in Tm3+ (Figure 1), a single pump laser can be used for all excitation steps, but there are cases where multiple pump wavelengths are required. Another type of mechanism involves energy transfer processes between different laser ions. Here, e.g. two laser ions in a metastable intermediate level interact to excite one ion into a higher lying state while the other one becomes deexcited (cooperative upconversion). High doping densities are usually required in order to make possible such energy transfers. Even at lower doping densities, some host media have a tendency for clustering of the dopants, facilitating energy transfers. Upconversion can be applied in upconversion lasers, where the laser wavelength is shorter than the pump wavelength. In other devices (e.g. erbium-doped fiber amplifiers), upconversion can cause parasitic losses. Figure 2: Fluorescence of thulium (Tm3+) ions in ZBLAN fiber under excitation with a 1140-nm laser. Upconversion processes lead to the population of relatively high-lying energy levels, from where blue and even ultraviolet light is emitted. 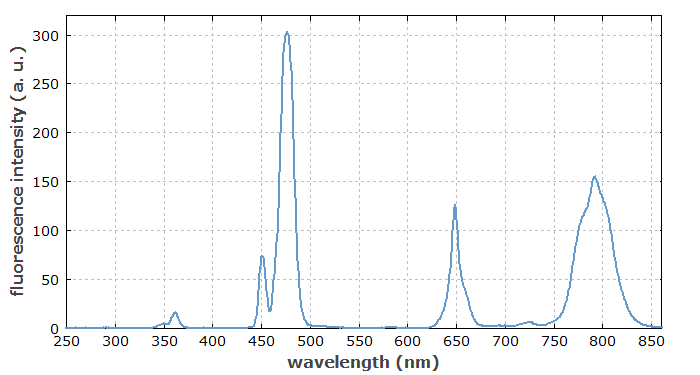 Such fibers allow lasing in the blue spectral region near 480 nm. (The weak peaks around 700 nm are artifacts, caused by second-order diffraction of ultraviolet light in the spectrometer.) Data taken by R. Paschotta in the ORC, Southampton. 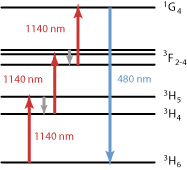 Upconversion fluorescence may be strongly suppressed (quenched) by multi-phonon transitions, as these can reduce the lifetimes of metastable levels. Fibers with low maximum phonon energy, such as certain fluoride fibers (e.g. ZBLAN fibers), exhibit much weaker multi-phonon processes and therefore much stronger upconversion. Such fibers are indeed suitable for very efficient upconversion fiber lasers. The term upconversion is also sometimes used for other types of processing which generate shorter-wavelength photons. An example is the upconversion of infrared photons to the visible spectral range by sum frequency generation in a nonlinear crystal. This can be used e.g. for single photon counting at long wavelengths, where no suitable detectors are available.